Birmingham LGBT’s SHOUT Festival of Queer Arts and Culture are delighted to announce a programme of screenings, talks, and events taking place across the city between 22nd-26th February to commemorate this year’s LGBT History Month. 2017 marks the 50th anniversary of the partial decriminalisation of homosexuality in England and Wales with introduction of the 1967 Sexual Offences Act. In recognition of this significant historical milestone Birmingham LGBT and SHOUT Festival of Queer Arts and Culture are proud to present a five-day celebration and exploration of the heritage of the Lesbian, Gay, Bisexual, Transgender, and Queer communities to coincide with LGBT History Month. This programme of film screenings, events, and discussions explores the changing faces of LGBTQ identities over the last fifty years, examining significant social and political changes and the representation of LGBTQ people on screen. Between Feb 22nd-26th we invite you to join us to celebrate, reflect, and come together in looking back at LGBTQ History in Birmingham and beyond. · ‘Under Your Nose’ (Screening & Discussion), Weds 22nd Feb, 18:30, CURZON BUILDING (BCU), FREE. Where and when was the world’s first Black Lesbian and Gay Centre opened? Here, in Britain, back in the turbulent 80s of Thatcherism, AIDS, and Section 28. Under Your Nose documents the struggles to set up this safe space. We are delighted to welcome to Birmingham director Veronica McKenzie, to screen her film, and to facilitate discussion about it, across the boundaries between generations. Click here for full details and to book. · ‘THE KILLING OF SISTER GEORGE’ (PLUS Q&A): THURS 23RD FEB, 19:00, MAC BIRMINGHAM, FREE. A free screening, discussion and Q&A of the iconic and controversial film ‘The Killing of Sister George’. The film follows the turbulent relationship that takes place between lovers June Buckridge (Beryl Reid) and Childie (Susannah York), and earned an X rating in the US and faced censorship challenges in Britain for its explicit portrayal of lesbian sexuality. Our panel discussion and Q&A lead by Dr. Mo. Moulton (University of Birmingham) will place the film in its historical context and talk about the importance of bars to lesbian culture, then and now. Click here for full details and to book. · THE AIDS GENERATION & ‘UNCLE HOWARD’: FRI 24TH FEB, 18:30, IKON GALLERY, FREE. Jose Arroyo (University of Warwick) will introduce the critically-acclaimed 2016 documentary ‘Uncle Howard’ with an illustrated talk on ‘the AIDS Generation’, exploring the history of the AIDS Crisis in the 1980s, its representation on screen, and the work of those now lost to us. This will be followed by a screening of 2016 critically-acclaimed documentary ‘Uncle Howard’. In 1989 35 year-old director Howard Brookner lost his life to AIDS. Twenty-five years later, his nephew, Aaron, sets out on a quest to rediscover his uncle’s work.‘Uncle Howard’ opens a vibrant window on New York City’s creative culture from the 1970s and ‘80s, and inspires director Aaron Brookner’s wide-ranging exploration of his uncle’s legacy – a complex, creative man; cut down in his prime, but who lived his short life to its fullest. Click here for full details and to book. 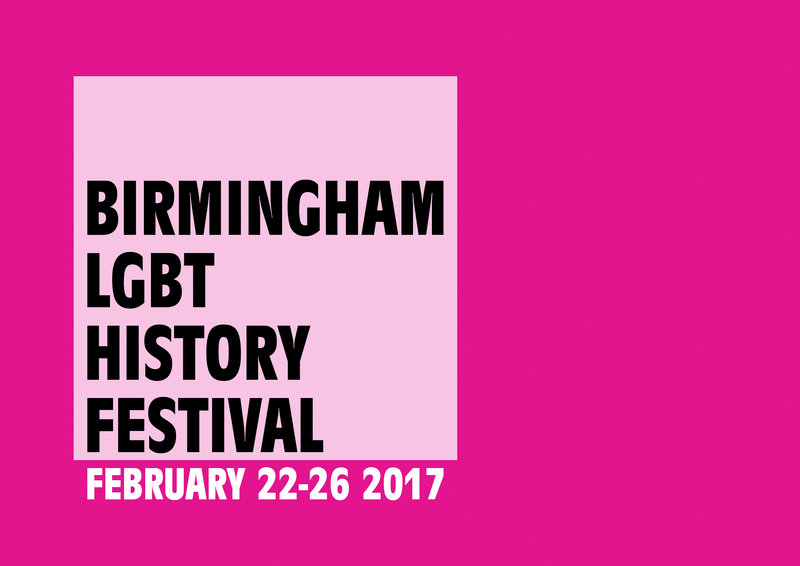 · SHARING BIRMINGHAM’S LGBT HISTORY: SAT 25TH FEB, 14:00-16:00, BIRMINGHAM LGBT, FREE. Join us for a rare opportunity to reflect on Birmingham’s LGBT History. This informal afternoon event will present an exclusive opportunity to see a newly unearthed collection of photographs documenting Birmingham’s Gay Liberation Front in the 1970s, we will also invite people to share their experiences of Gay Birmingham both past and present, launching a new long-term project to uncover more of the city’s LGBT history told through the experiences of its people. Click here for full details and to book. Nominated for 8 Academy Awards, Moonlight is a timeless story of human connection and self-discovery, chronicling the life of a young black man from childhood to adulthood as he struggles to find his place in the world while growing up in a rough neighborhood of Miami. At once a vital portrait of contemporary African American life and an intensely personal and poetic meditation on identity, family, friendship, and love, Moonlight is a groundbreaking piece of cinema that reverberates with deep compassion and universal truths. Click here for full details and to book. A rare screening of the Emmy award winning film based on Quentin Crisp’s much celebrated coming-of-age memoir The Naked Civil Servant. Spanning the life and times of the author from the 1930s-1970s, Quentin Crisp, a self-described flamboyant homosexual (played in a BAFTA winning performance by John Hurt) The Naked Civil Servant depicts a man struggling to live an openly gay, flamboyant lifestyle during a time when homosexuality was against the law in Britain. This screening will include an introductory talk on the life and legacy of Quentin Crisp, further details about speakers to be announced. Click here for full details and to book. This programme of events if funded by Arts Council England, Birmingham City Council LGBTA Employees’ Network, and the National Lottery’s ‘Big Lottery Fund’. Birmingham City University’s Black Studies Research Cluster, BCU LGBT+ Staff Network, The Centre for Modern British Studies (University of Birmingham), The Electric Cinema, IKON Gallery, mac Birmingham, University of Birmingham’s Staff Rainbow Network, and Unmuted.